Discussion in 'Charging Standards and Infrastructure' started by doug, Nov 16, 2009. The article mentions quick charge socket being capable of 50 kW. Is plug design proprietary? Here's a 2008 presentation by TEPCO on those quick-charging stations. Explains the confusion with the i-MiEV quick charge connector. For some reason Mitsubishi keeps quoting the input of the charging station rather than what the car sees. Saw the new TEPCO fast charger. I could pull out the connector, but there seemed to be no power to it yet, not that I had anything to plug it into anyway. Ready for Nissan Leaf to make the trip SF <-> Sacramento? Maybe. I am trying to get more info. I thought though that all the early deliveries (at least the "public" production ones) would have the fast-charge port disabled (initially at least). The nation's first public DC fast charger (49 kW) was dedicated this morning. Wonder why it only appears to be supplying about 24 kW here. Wonder why it only appears to be suppling about 24 kW here. The batteries do not charge linearly so the power output will vary while charging. Also, the charging speed typically given for the iMIEV is ~30 minutes for 80% or ~26kW. Maybe this should be in the fast charging thread. That thread was more about a faster type of "fast" charging or fast charging in general. I'll pull together the TEPCO specific stuff some time tomorrow. Given that the Mennekes connector is capable of Level III (via 3 phase), I wasn't aware that these are being installed in Europe as well. Late last week, Epyon unveiled Europe's first commercial electric vehicle (EV) fast-charging station at a fueling depot in the Netherlands. A single Epyon fast-charging station has several outlets, so multiple EVs can be charged simultaneously. 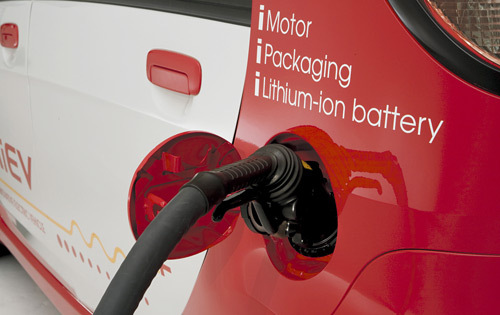 The charging station in Leeuwarden and all future stations of Epyon support the international CHAdeMO-standard for quick-charging protocols, the company said. Mennekes is a proposal for the new IEC 62196-2 standard, which is still in progress. It's just about to finish the "second committee draft" stage at the end of the month and is scheduled for full completion by the end of October. The Dutch Taxi firm above probably needed something quick and off the shelf for their conversion. The danger here is that with the likes of this, Nissan and Mitsubishi coming, the IEC standard might arrive to the party late. It wouldn't be the first time a superior standard has shown up and found everyone else got there and drank all the beer, so to speak (I'll refrain from using any other analogy). Even in the world of EV's they've tried before. Supposedly this TEPCO/CHAdeMO standard is still in progress as well. Still don't see the need for these massive, expensive chargers for this amount of power. About half way between Sacramento and SanFrancisco in a place called Vacaville, affectionately also known as "Voltageville" or (some say) "Voltsville". Has 4 Tesla charges (2 each at two locations, including this one, and one on other side of same Interstate). I have been reading these reports, and something is bugging me. To prove the iMiev could drive San Francisco to Sacramento they drove 54 miles to Vacaville, arriving essentially empty. Then they get an 80% fast charge and drive on the remaining 30 or so miles to Sacramento. BUT ... What if they were going the other way? They'd arrive 50% full at Vacaville, and then have a much longer wait as you can't push charge into the battery above 80% nearly as fast. Potentially it could take an hour or more to do the last 20%. And you couldn't afford not to fill that last 20% as you'd need every kWh to get from Vacaville to San Francisco. 1. Don't take your iMiev to Sacramento and expect to be coming back! 2. Fast chargers can't just be at the mid-point of a route - they need to be well past the mid-point in each direction. 3. Battery capacity matters - here Tesla has it 100% right. A fast charging vehicle with 16 kWh/50-60 mile freeway range (like the iMiev) is nowhere close to the utility of a 150-180 mile freeway fast-charging vehicle (e.g. 230 mile version of Model S). Apart from the first 50-60 mile leg, the iMiev thereafter needs to be recharged every 45 miles (due to the 80% fast charge limit - 40 miles if you don't want to be driving on empty at the end of each leg). This means a 20 minute stop every 3/4 hour. The 230 mile Model S would need to be recharged every 100-120 miles, or around 1 and a half to two hours. This seems closer to the intervals I find comfortable for longer drives. Assuming 45 minute 80% recharge (as I believe Tesla have suggested) I would find the breaks comfortable length too.